Salt is 40 percent sodium and 60 percent chloride -- both table and sea salt have the same chemical makeup. In the 1920s, the U.S. started adding iodine to table salt in response to a large segment of the population becoming iodine-deficient. Your thyroid needs iodine to produce the hormones that control your metabolism. Although sodium has almost no effect on your thyroid, too little iodine in your diet can result in hypothyroidism. If you suspect you have low thyroid function, see your doctor before taking any type of iodine supplement. Located at the base of your throat, directly in front of your vocal cords, your thyroid produces two hormones that regulate metabolism. If your thyroid slows production of T3 and T4 hormones -- a condition referred to as hypothyroidism -- your metabolism will slow down. Typical signs of hypothyroidism include weight gain, an intolerance to cold, an irregular heartbeat and elevated cholesterol levels. Your metabolism controls how quickly all of your systems function, and everything slows down if your thyroid does not manufacture enough T3 and T4 hormone. Fortunately, hypothyroidism is simple to treat; taking a daily synthetic thyroid hormone replacement -- levothyroxine -- supplies the missing hormone. Expect your doctor to monitor your thyroid levels with blood tests twice a year. Without iodine, your thyroid cannot manufacture T3 and T4 hormones, resulting in a reduced rate of metabolism. The most common cause of hypothyroidism is an autoimmune deficiency, but it can occur as a side effect of pregnancy as well. Iodine deficiency is very rare in North America and Europe, although 40 percent of the world's population is at risk for an iodine deficiency. Both table salt and flour used to have iodine added, but iodine is no longer added to flour, and this is no longer the case with most table salt too, according to Dr. Marcelle Pick. Pick, a published author and co-founder of the Women to Women Clinic in Yarmouth, Maine, says that "iodine intake has declined 50% in North America in the past 30–40 years" and more people may be at risk for thyroid problems, especially those who avoid table salt on a low-sodium diet. Additional iodine will only treat hypothyroidism if your low thyroid function is caused by an iodine deficiency. Your doctor can test for your iodine levels using a urine sample. Adding too much iodine to your diet can result in thyroid iodine toxicosis. Ideally, you should consume between 150 and 299 micrograms of iodine daily, says the American Thyroid Association. Consuming less than 75 micrograms can result in a moderate to severe deficiency while amounts greater than 450 micrograms are excessive and could lead to thyroid iodine toxicosis. One teaspoon of iodized table salt contains 400 micrograms of iodine -- more than enough to keep thyroid hormone levels in an ideal range. Sodium used in processed and packaged foods does not have iodine added to it and should not be counted toward iodine intake. Not all salt is iodized -- read the label carefully. 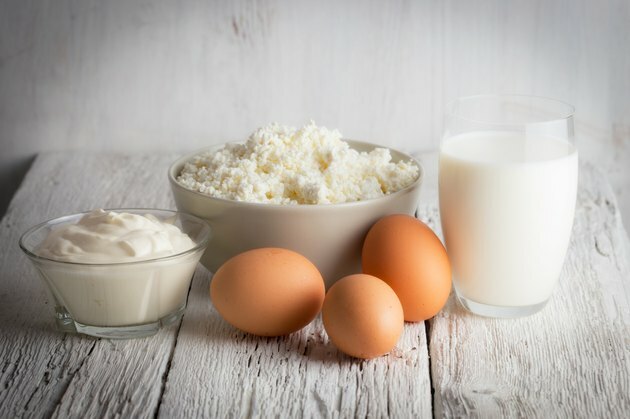 If you're eating a low-sodium diet, eggs, dairy, soy milk, fish, seafood and iodine supplements are available to ensure adequate iodine consumption.